ניהול אחר אפל: צבא התפוחים הסודי. An article by Dor Zach, correspondent at Calcalist, the largest economic newspaper in Israel. I offered some thoughts on Apple’s current strategy, and the various misconceptions about the company. (Hebrew only so if anyone wishes to summarize it in comments, it would be helpful to others). How much time do you spend looking for things — things you already own? How often do you give up, unable to find what you’re looking for? We can find information in seconds via Google, yet we struggle to find silverware in our homes. WhereIsMi organizes your things in a big tree that you build as you go. For example, you can add a room, then add a closet to that room. Add a shelf to that closet, then add Mother’s silver to that shelf. The next time you search WhereIsMi for “silver” you will be given a natural path to its location: Bedroom > Closet > Top Shelf > Mother’s Silver. You can also navigate this tree manually to add new things or just to browse. WhereIsMi is very flexible. For example, you can use it to bookmark your favorite stuffing recipe. Or use it to record an item’s details, like its serial number. 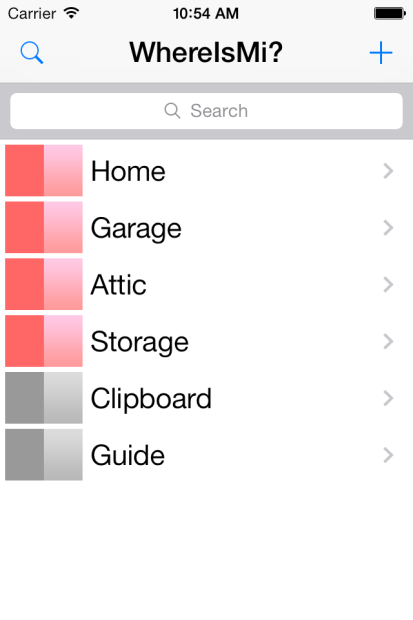 Use Siri to dictate a box’s contents. Or use your camera to photograph the box’s contents instead. Or photograph the box’s label so you can visually identify it later on. WhereIsMi is free, and it has no ads! Just in time for sorting and filing all the post-holiday gifts. I join Moisés to discuss 4K, 8K, and the future of the displays we use to consume our content. Will presentation quality ever be “king” again, or is cheap, short, indexable content the new ideal? We dive a bit more into YouTube, my favorite TV disruptor. via 5by5 | Screen Time #49: The Next Stage. The Critical Path #106: Can Bitcoin Be Money? This the the first of hopefully a series of talks on Bitcoin. The hope is to assess it as a disruption but first we need to understand the differences between a store of wealth, a currency and money. Then we need to understand what jobs each of these is hired to do and whether Bitcoin is better or worse than the incumbents and whether it has “headroom” to get better in those cases where it’s not good enough. via 5by5 | The Critical Path #106: Can Bitcoin Be Money?. In a world where everyone needs to present, few know the power that lies under their fingertips. Whether one-on-one or in front of millions on TV, presentations are the primary means of persuasion in business. Have you ever cringed at text-only slides or puzzled over graphs that made no sense? Steve Jobs saw “PowerPoints” as “rambling and nonsensical” and had them banned internally. But he used visuals for all his keynotes. What made them tolerable, even persuasive? The problem is that most people receive no training in how to compose the most crucial images they project to an audience and the tools available do not take advantage of motion, touch, processing power, mobility and high resolutions. Airshow teaches principles of visual persuasion using techniques of cinematography and visual storytelling. Airshow shows how tablets create a new stage for your performance. 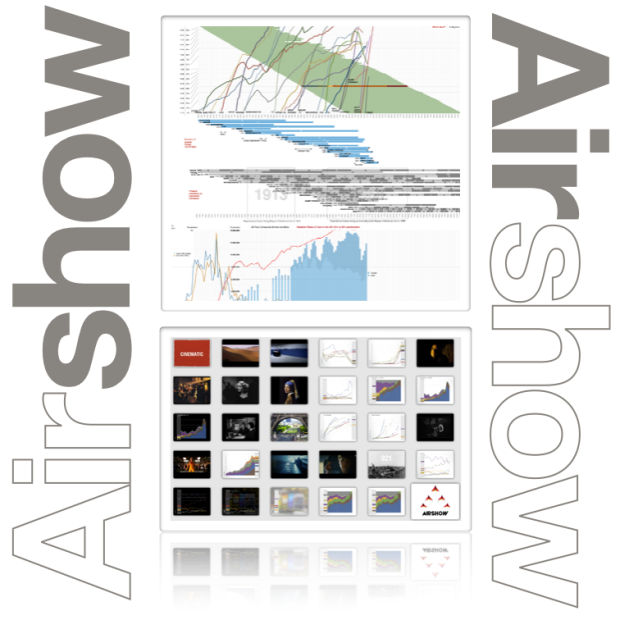 Airshow applies Aristotelian rhetoric, Cinematographic theory and Cinematic storytelling as well as Tufte design principles into a new medium. Persuade with logic, empathy and credibility. Get hands-on experience with modern tools of persuasion including tablets and interactive, touch-based interfaces. You have the data. You have the audience. All you need is a story and a screenplay. How do you build them? There are techniques which are proven to work. They’ve been used by writers, performers and playwrights for centuries. Professional presentation coaches will teach you far less and at greater expense. Airshow is better and less expensive, especially in terms of time. Airshow is an intimate experience. Audience size is limited. All the tools and techniques needed in one day of intense, inspirational and engaging training. Airshow could be coming to a town near you but to make it happen you need to act now. Here’s how it works: For every month in 2014 an Airshow event will be hosted. The location for that month will be locked-in when the first 20 registrations for that city will be recorded. Any registrations that take place before the location is locked-in will be half-price. Now is the time to learn presentation skills for the post-PC era. Just like there is no writing which does a movie justice, I can’t write here how it’s done, you have to see it live. When describing the process of disruptive innovation, Clay Christensen set about to also describe the process by which a technology is developed by visionaries in a commercially unsuccessful way. He called it cramming. Cramming is a process of trying to make a not-yet-good-enough technology great without allowing it to be bad. In other words, it’s taking an ambitious goal and aiming at it with vast resources of time and money without allowing the mundane trial and error experimentation in business models. To illustrate cramming I borrowed his story of how the transistor was embraced by incumbents in the US vs. entrants in Japan and how that led to the downfall of the US consumer electronics industry. Small upstarts were able to take the invention, wrap a new business model around it that motivated the current players to ignore or flee their entry. They thus successfully displaced the entrenched incumbents even though the incumbents were investing heavily in the technology and the entrants weren’t. In the image below, the blue “path taken by established vacuum tube manufacturers” is the cramming approach vs. the green entry by outsiders who worked on minor new products which could make use of the rough state of transistors at their early stages of development. 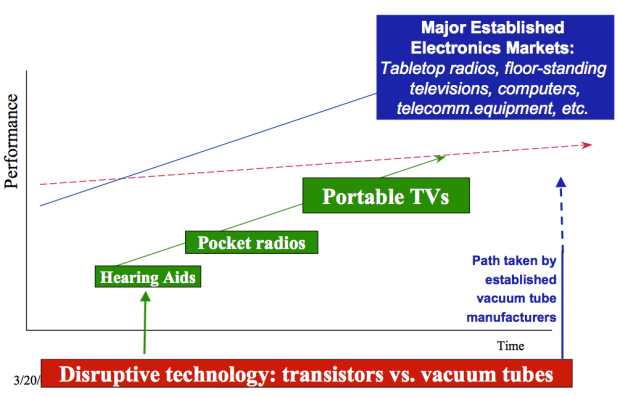 The history of investment in transistor-based electronics shows how following the money (i.e. R&D) did not lead to value creation, quite the opposite. There are many such examples: The billions spent on R&D by Microsoft did not help them build a mobile future and the billions spent on R&D by Nokia did not help them build a computing future. There are other white elephant stories such as IBM’s investment in speech recognition to replace word processing, the Japanese government spending on “Fifth Generation Computing” and almost all research into machine translation and learning from the 1960s to the present. But today we hear about initiatives such as package delivery drones and driverless cars and robots and Hyperloops and are hopeful. Perhaps under the guiding vision of the wisest, most benevolent business wizards, breakthrough technologies and new infrastructures can finally be realized and we can gain the growth and wealth that we deserve but are so sorely lacking. This was initially posted on LinkedIn December 16, 2013. Innovation comes in many forms. Many times innovation is thought of as technological improvement or as invention. We can all cite examples of inventions which turned into industries which re-defined civilization. The steam engine comes to mind but there were many others before and after. Inventing something is certainly a way to create value but it’s not as common or as reliable a method as it might seem. Creating Intellectual Property is one thing, finding a defensible market and business model is quite another. More often companies innovate in terms of processes or the “algorithms” which are used to deploy existing resources. Wal*Mart was immensely innovative in the way it organized itself and laid out a low-cost business model. More recently Amazon has innovated in distribution and fulfillment based on the ability to dispense with showrooms for products and sell directly online. There is little in terms of technology which Amazon “invented”. Rather, it deployed off-the-shelf technology in a novel way. But what I want to address is a more mundane sort of innovation: marketing innovation, specifically pricing. Few would consider a price model to be an innovation but in fact it’s a core lynchpin to many breakthrough innovations. It was pricing which permitted Henry Ford to build an industrial empire. He could have built cars for those who could afford them as cars were defined in 1907 but he chose to build a car around a price point which was around the median of the population. A car “so low in price that no man making a good salary will be unable to own one.” His business logic began with a price and the product and process followed. What’s the point of an agile standup meeting? Gone are the days of 30-minute status meetings where most people are half-asleep or pecking away on their laptops, oblivious to what’s being said. Agile standups are the leaner, more efficient cousin of status meetings where attendees actually stand up. On our feet, we’re more focused, attentive, and concise. It’s science! Whether you need robust tools for planning and tracking projects, communicating with coworkers, deploying products, or just some general tips on how to run an agile shop (and how to run them), Atlassian is here to offer you the tools and advice you need to get the most out of your agile practice. Horace unpacks the rumored, denied, and seemingly inevitable arrival of iPhone on China Mobile. Reflecting on smartphone adoption in the US, where does the unconventional logic take us from here? via 5by5 | The Critical Path #105: Subsidize This.